Oh my, yes. When I was 31, I quit a job as executive producer at a large women’s website to do my yoga teacher training. I had been practicing yoga for a little over six years at that point, and it had been steadily playing a larger and larger role in my life. I wanted a job that was more in the moment and real and less sitting in front of a computer, so I thought, why not teach yoga? The irony is that the year I spent primarily doing yoga and meditating showed me very clearly that what I wanted to be doing was writing. Which, clearly, still requires me to be sitting at a computer, but I can do it on my own terms (and my own schedule) and I can choose exactly what I want to write about. Which is nearly always wellness, stress reduction, and remembering (and focusing on) what really matters to you. My chosen subject matter pays homage to where I found the inspiration and the fortitude to finally name my desire to be a professional writer. Later, I also shifted from working exclusively as a writer to include coaching after I hired a coach myself. 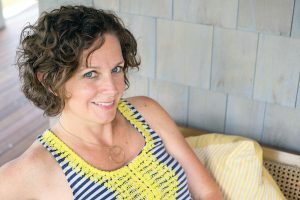 I thought I wanted her to help me figure out how to make more money as a writer—particularly after I had my two children and the recession had hit. But having someone on my team who could ask me the right questions and then help me objectively see what I was truly longing for was so powerful, it inspired me to start providing those things to other people. That does let me step away from the computer. And even more importantly, it helps me connect to people in real time and have an energetic back and forth with them that simply can’t happen through the written word (as much as I love it). So now I do both—coaching and writing. 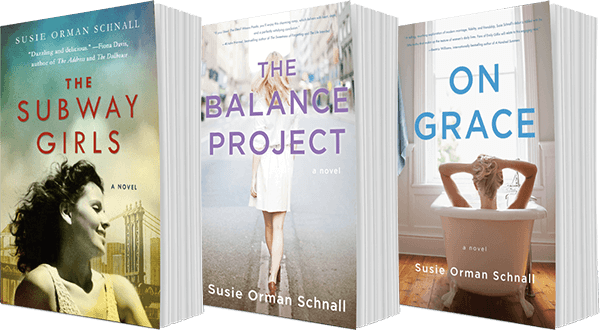 It’s a constantly evolving balance between which I’m focusing on more, and I love the diversity of it. It keeps things fresh but also helps me relax as I don’t have all my work eggs in one basket. It’s like taking a photo of yourself, and in that moment you’re thinking, “My hair’s crazy, I don’t like the way my body looks in these clothes, I’m not cute.” And a few years later you look at that photo and think, “I was adorable! Look at the sparkle in my eye!” The reality of who you were in that photo never changed, but your perception did. So, my basic premise is, you already have all you need. You have to challenge yourself to look at a snapshot of your current life and see all the many ways you already have it all. And then, the really good news is, there is always more available—more freedom, more healing, more success, more insight, more growth. You are never “done.” Which means you will only have more of “it all” as you go. I’m still working on finding a balance between planning things and letting things happen. I write out quarterly goals and feel good about them, and then when I go back and review them, nothing happened when I thought it would. Intellectually and spiritually, I know the timing doesn’t matter—the real power comes in writing down my goals and then putting the actions that add up to those goals on my calendar. But my ego likes to pipe up in that instance and say, “See, I told you you were no good at this goal-setting stuff. You said your website would be re-launched by January and it’s already April!” So then I will rebel and stop writing goals down, which doesn’t work either. This isn’t just in business; this is a challenge for me in parenting, too. Especially when my kids were little, I was completely uptight about their naps and bedtimes. On the one hand, sleep is incredibly important. On the other hand, so is having fun and spontaneity. Part of me would still like to orchestrate my kids’ every move, even though I know that doesn’t really serve anyone—not me, not them. I’m still learning when to stick to my guns and when to just let things flow. Delegating! I just hired someone to run errands for me and it is so awesome! I highly recommend it. I’ve also gotten way better at de-compartmentalizing my life, so that I can fulfill many aims with one effort. For example, taking a walk to run an errand (exercise and life management), or stepping away from my desk during the day to prep food for dinner—which always helps me have a fresh idea about what I was working on while also doing something creative and feeding my family. Definitely, de-compartmentalizing frees up so much energy and helps me get more done (see above). Also, taking the long view. If you’re looking at 24-hour period and wondering how you’ll ever get it all done, you’re setting yourself up for feeling like what you want isn’t possible. Instead, take a longer view: there are only 24 hours in a day, there’s no getting around it, but there are 168 hours in a week—it gives you a lot more room to work with. So, start thinking about what you want to do on a weekly basis, absolutely. But also, a monthly basis and a yearly basis. Also, a friend just told me about an app called BreakFree that keeps track of how much you interact with your phone and helps you really think twice before you pick it up for a compulsive check-in. We all need time to be bored and to daydream, but that’s hard to do if you reach for your phone every time you get a couple minutes of downtime—which I am totally guilty of. I’m dying to do it right now, in fact. So, I haven’t tried this yet, but doesn’t that sound so helpful? Going to go download it when I’m done here. From a mentor/co-worker? A co-worker taught me that handling a lot of different projects is much more doable and easier if you are always clear on what your top priority is—it helps you not get distracted by whatever’s on fire. From your spouse? He really encouraged me to work for myself. When we met, I had started to freelance as a writer but was still working a part-time job so I knew I would be able to pay my mortgage. I was scared to give up that steady gig, even though it was keeping me from growing my freelancing business. He had already been working for himself for a few years and he basically told me—and showed me—to come on in, the water’s fine. Also, he is great about taking time to do things that he loves doing. Right now, that’s playing golf. He doesn’t feel guilty about it and he still gets tons done. He encourages me to do the same, both verbally and just by modeling. • Whatever you’re doing now is the best possible thing you could be doing. • It’s okay to get things wrong. • Getting up early in the morning is a great way to teach yourself to go to bed earlier. • It’s okay to feel how you feel. • Hugs make everything better. That there are no wrong decisions. A foreign language, and how great it feels to have built up a lovely nest egg from things that I created. Carrying the groceries in from the car and putting them away. Also, making lunches. I can totally outsource these things to my kids; thanks for reminding me to get started on that! They are old enough. The person who comes up with the names of paint colors. Lit: A Memoir by Mary Karr, The Diving Bell and the Butterfly by Jean-Dominique Baby (The fact that he wrote it by blinking his eyes just slays me. ), This Is the Story of a Happy Marriage by Ann Patchett (Ann Patchett makes me dream bigger writing dreams. ), The Clan of the Cave Bear by Jean M. Auel, and The Mists of Avalon by Marion Zimmer Bradley. On the self-help front, I love I Don’t Want To, I Don’t Feel Like It by Cheri Huber. Activity? Sitting for too long at a stretch. Food? Occasionally, I need to stick my face in a bag of chips. Website? Facebook! UGH. Also, shopping for shoes on Nordstrom.com. I pretty much never purchase them. I just add them to my cart. Notes from the Universe by Mike Dooley and an email from Abraham-Hicks. I think I: am incredibly lucky to live during a time where we can cook up careers for ourselves and pursue them with abandon. The only thing in our way is us. I wish: could figure out how to stay in better connection with long-distance friends. My kids: completely blow my heart wide open. You can’t change a habit you don’t know you have… Where there’s a want, there’s a way… What you seek is seeking you. Kate Hanley helps busy people remember—and focus on—what’s important. 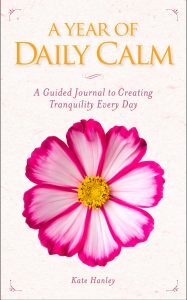 She is the author of A Year of Daily Calm and The Anywhere, Anytime Chill Guide: 77 Simple Strategies for Serenity. Her work has appeared in Real Simple, Yoga Journal, Whole Living and Parents. A career highlight for Kate was appearing on the Today Show, where she realized seconds before being on air that her sweater was on backwards; it was the perfect opportunity to practice what she preaches. Kate lives in Providence, RI, with her husband and two kids.